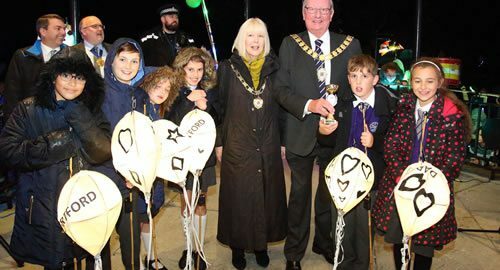 12 local schools and some 650 children who benefited from free creative arts workshops then took part in a lantern parade led by the Mayor of Dartford John Burrell, KECC CEO Gurvinder Sandher, Gareth Johnson MP and the Leader of Dartford Borough Council Jeremy Kite MBE. The parade started in the High Street and then went via Hythe Street, the Orchard Shopping Centre and Market Street to Central Park where it climaxed by the Band Stand. Once the Festival reached Central Park after a series of short performances and presentations to the schools, the evening climaxed with a spectacular fireworks and lights display to climax the celebrations delivered by the awards winning Phoenix Fireworks.